Kitchen Countertops: What Material Works for Your Home and Budget? If you are looking to spruce up your kitchen, whether it be a complete remodel or not, your countertops are the perfect place to start. The right countertops will set the tone for the entire room, however choosing countertops is easier said than done. With all the material types out there, how do you know which one to choose? Follow this handy guide below and you will know which material is right for you in no time. If budget isn’t a concern, you can’t beat quartz countertops. These powerful countertops are heat, impact, scratch, acid, and stain resistant, making them basically maintenance free. The nonporous surface doesn’t have to be sealed and these countertops come in so many colors, you will have no issue matching your chosen color scheme. Polished and honed granite countertops are both popular options. While granite isn’t as heat or scratch resistant as quartz, it is still highly resistant, so you don’t have to worry too much. It’s also elegant and can increase the value of your home. You are likely familiar with polished granite countertops. Honed countertops are a little less common but equally as elegant. Instead of a polished finish, these countertops have a soft matte finish. While it technically costs less to manufacturer honed granite countertops, they are typically more expensive than polished granite countertops due to availability. That is the key when picking granite. You can save a lot of money by choosing something that is readily available. If the store has to send out for it, the price will go up drastically. While not as popular as granite countertops, soapstone, and limestone are also regarded options. These countertops don’t come in many colors, though, and they aren’t as easy to clean and maintain as some of your other options. You must be delicate and use great care when handling these countertops. If you love the rustic look of natural stone, they are a great option, but if not, you might want to go with an option that is more affordable and easier to maintain. If you love the idea of natural stone, but want something that is available in a variety of colors and is easy to maintain, go with engineered stone. You will really have to try and harm these countertops to ruin them. They are around the same price as granite, however, so if you are budget conscious, engineered stone may not be the countertop for you. Do you love the idea of having a modern kitchen? If so, concrete countertops are a great place to start. You can customize them to your liking, all the way down to the texture and color. These countertops also capture and release heat, making them energy efficient. You can get concrete countertops for less than granite, but if you want to truly customize these countertop, it is going to cost around the same as granite. 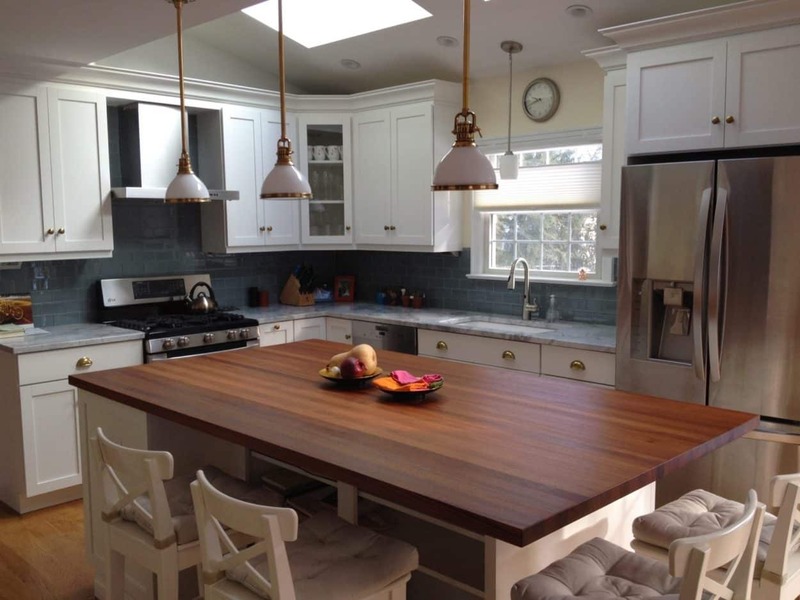 Wood countertops, including the popular butcher-block type, are a great way to create a warm look in your kitchen. These are a cinch to clean, and if you scratch them, you are usually able to sand it out. Water can hurt the countertops, so you need to oil them on a regular basis to help keep them sealed. As far as price, you can find some wood countertops on a budget, or you can find yourself paying top dollar. This makes them a great choice for just about anyone. If you are on a tight budget, consider laminate countertops. Laminate has changed a lot over the years and now you can get it in patterns that look like wood, quartz, and natural stone. You can even find them in bright colors. This is a great way to make your home look expensive and luxurious without spending a ton of money. You do have to be careful avoiding scratches and burning with these countertops, but if you take care of them, they can hold up for years and years. PRO TIP: An important thing to keep in mind when pricing your new countertops, is that although they may be priced per square foot as a guideline, many other factors can come into play. Common price influences include slab yield, grain direction, and waste factors. Then there are some cases where you are obligated to purchase the entire slab, regardless of your project size. At Trade Mark, we recommend receiving a quote that is specific to your project and material selection before purchasing. Give us a call at 973-636-0100 if you need assistance with pricing or any other project requirements! As you can see, you have plenty of choices when it comes to selecting countertops. You can browse your options and learn more when you visit the Trade Mark Design & Build showroom in Hawthorne, NJ. Our skilled team is here to help you with your kitchen remodel, all while keeping your personal style and budget in mind. Let the design team be your partner as you give your kitchen the makeover it desperately needs.